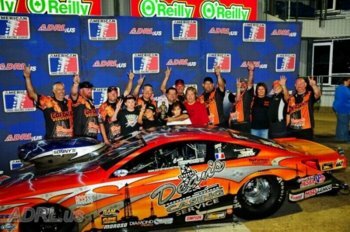 (October 20, 2012) - Extreme Pro Stock driver Cary Goforth, Pro Extreme Motorcycle rider Eric McKinney and Aeromotive Fuel Systems Pro Modified driver Mike Castellana were already able to celebrate American Drag Racing League (ADRL) world championships on Saturday. 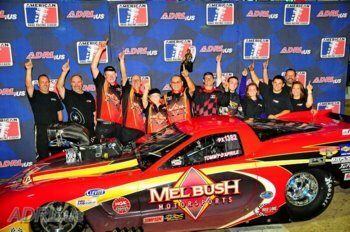 But the talented trio also earned an extra chance to celebrate as they each won the ADRL World Finals VIII presented by CarSafe at the Texas Motorplex. In winning his second straight world championship in XPS, Goforth and his Jerry Haas Race Cars GXP went 4.096 at 175 mph to beat John DeFlorian and cap off his tremendous back-to-back championship run. "It feels good to come here, get the win and get the championship," said Goforth, who also thanked Sonny"s Racing Engines in winning for the third time in 2012 and ninth time in his ADRL career. "This is just a great feeling. "That makes this very sweet. It was a great team effort from a great group of individuals. We are extremely happy." Three other drivers " Tommy D'Aprile (Pro Extreme), Pat Stoken (Pro Nitrous) and William Brown III (Summit Racing Equipment Top Sportsman) - won for the first time in the ADRL at the World Finals VIII presented by CarSafe, while Billy Glidden added to his record win total as the ADRL closed out its 2012 season in fine fashion. It also officially awarded world championships to Mick Snyder (Pro Extreme), Bob Rahaim (Pro Nitrous), Alan Pittman (Mickey Thompson Extreme 10.5), McKinney, Goforth, Castellana and Marco Abruzzi (Summit Racing Equipment Top Sportsman). All of those world champions - and special award winners - will be honored on Sunday at the ADRL"s Racer Appreciation and Awards Gala. Goforth, Castellana and McKinney all closed out championship seasons with a win, as Castellana claimed a world championship for the second season, this time in Aeromotive Pro Modified. 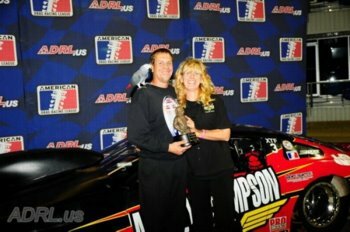 He finished the 2012 season with five victories, going a weekend-best 3.857 at 195.22 mph in his Al-Anabi Racing 2012 RJ Race Cars Camaro to beat Mike Janis in the finals. "Knowing we had already won the championship, that made us relaxed for the finals. Getting that win was sort of the icing on the cake, I guess you would say," Castellana said. Castellana trailed Jeff Naiser by more than 100 points heading into the weekend, but Naiser didn"t qualify and Castellana was in the 3.80s all weekend, edging out Pat Musi for the championship and running past Janis in the finals. 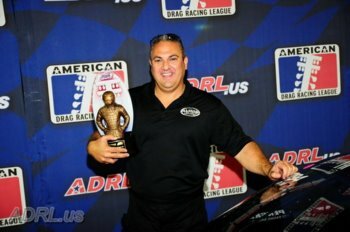 "We figured we had a chance, but we knew we had to have some things go our way," said Castellana, who has 14 career wins between Pro Nitrous and Aeromotive Pro Modified. "Shannon and the crew did an amazing job with the car, and I just have to thank Sheikh Khalid (Al-Thani) for supporting us. "Winning five events is just awesome and shows what this team can do." McKinney won five straight races to close out the season, capping off his remarkable year in Pro Extreme Motorcycle by going 4.032 at 176 mph to knock off Dave Norris in the finals. "This is how we wanted to finish. This win was as big as any we had," McKinney said. "We were on a roll and we wanted to keep it going. It carries you into the winter and next year, and this was big." McKinney qualified No. 1 with a 4.051 and then went 4.042 in a first-round win before stepping it up in the finals. 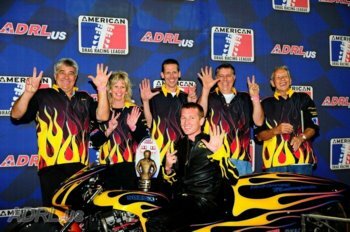 In all, McKinney finished with seven wins " the most for any ADRL competitor in 2012 " and advanced to nine finals. "This whole team is incredible. If it wasn"t for them I wouldn"t be here. They definitely make me more comfortable on the bike," McKinney said. "When we come to race, we"re here for one reason and we do everything we can to win. This is just overwhelming." Tommy D'Aprile capped off his first winning weekend in the ADRL with a 3.633 at 206.51 mph to beat Von Smith in the Pro Extreme finals. Driving a Jeffers Pro Cars Corvette, D'Aprile was also helped by a brilliant .009 reaction time against Smith. "I was in the zone driving and on the tree, and the guys were just flawless with this car today," D'Aprile said. "Todd (Tutterow) tuned the car perfectly. This just means so much to us and I"m just fortunate to be part of this team." An overjoyed D'Aprile was overcome with emotion in the winner"s circle, dedicating the victory to Mel Bush Motorsports owners Mel and Joanne Bush. "This is just surreal. I don"t know how it gets any better than this," D'Aprile said. "I"m so gracious for Mel and Joanne, and I can"t thank them enough. I"ve struggled throughout my career, but I really think this is just a sign of things to come." Snyder clinched the world championship in his heated race against Jason Scruggs when Scruggs went red against Smith in the second round. Snyder and the Powersource Transportation team advanced to the semifinals, firmly securing their first ADRL world championship. Pat Stoken and his RJ Race Cars "69 Camaro went a blistering 3.786 at 198 mph in the Pro Nitrous finals, knocking off Shannon Jenkins in a thrilling first victory. With the help of Reher-Morrison, Switzer Dynamics and his two sons, Stoken chased down Jenkins and ended up in the winner"s circle for the first time after four previous final round appearances. Stoken qualified No. 1 with a 3.769 and then was consistent in eliminations, running a 3.83 and 3.82 before stepping it up in the finals. "It still hasn"t sunk in that we just won. It"s just unbelievable and it makes the winter a lot better," Stoken said. "I still can"t believe it, and then to go in the 3.70s in the finals is just icing on the cake. "We were consistent all weekend and the car was just flawless. It went down the track every time." 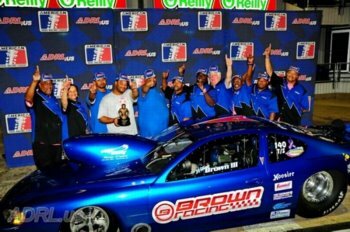 William Brown III made a valiant run for the championship in Summit Racing Equipment Top Sportsman, but came up just short as Abruzzi advanced to the semifinals to clinch the first world title for the class in the ADRL. But Brown took the consolation prize, which was going 4.222 at 168 mph to beat Glenn Butcher in the finals and pick up his first ADRL win. "It feels great to finally win one. To be able to do that, it"s like finishing the year with a bang," Brown said. "I would have liked to get two trophies, but I will take one." Brown finished second in the points standings, with the win providing the perfect finishing touch to a standout season. "All that hard work paid off and that"s the best thing. It does make you feel good that you accomplished something like this after all of the hard work," Brown said. "The team stuck by me, worked hard and we all did what we had to do. It was a good day." Billy Glidden picked up his second straight win and an ADRL-best 15th for his career, going 3.946 at 187 mph to beat Dan Myers in the finals of Mickey Thompson Extreme 10.5. Glidden went as quick as 3.915 at 190 mph, qualifying No. 1 and ending his season on a strong note. "We finally hit our stride and had a great weekend, so that was definitely exciting to see," Glidden said. "It"s taken a long time for us to get everything figured out, but we did and that feels great." Kevin Helms gave Mopar its first win in the SuperCar Showdown, going 5.889 at 116.42 mph, knocking off Fred Henson in the finals. In Pro Junior Dragster, Cole Burk knocked off Griffin Rider with a 7.922 at 77.30 mph. 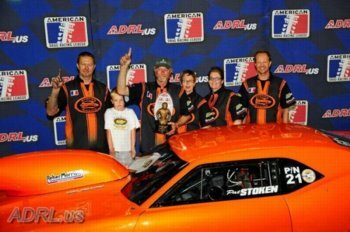 PJD"s Alex Oppen was also officially named the world champion in the class. Pro Extreme -- Tommy D'Aprile, Chevy Corvette, 3.633, 206.51 def. Von Smith, Chevy Camaro, 4.314, 118.58. Pro Nitrous -- Pat Stoken, Chevy Camaro, 3.786, 198.03 def. Shannon Jenkins, Camaro, 4.729, 111.02. Extreme 10.5 -- Billy Glidden, Ford Mustang, 3.946, 187.11 def. Dan Myers, Chevy Cameo, 4.501, 142.58. Pro Extreme Motorcycle -- Eric McKinney, Suzuki, 4.032, 176.03 def. Dave Norris, Suzuki, 4.130, 171.97. Extreme Pro Stock -- Cary Goforth, Pontiac GXP, 4.096, 175.57 def. John Deflorian Jr., Chevy Camaro, 4.102, 176.26. SuperCar Showdown -- Kevin Helms, Dodge Challenger, 5.889, 116.42 def. Fred Henson, Ford Mustang, 5.945, 117.04. Pro Mod -- Mike Castellana, Chevy Camaro, 3.857, 195.22 def. Mike Janis, Ford Mustang, 4.488, 121.90. Top Sportsman -- William Brown III, Pontiac Grand Am, 4.222, 168.94 def. Glenn Butcher, Chevy Camaro, 4.240, 167.53. Pro Junior Dragster -- Cole Burk, Hardens, 7.922, 77.30 def. Griffin Rider, HalfScale, 7.868, 81.99.